Herve Tuyishime was born and grew up in Rwanda. After graduating in 2011 from Kigali Institute of Management with a degree in business management, he worked as an accountant in insurance companies. 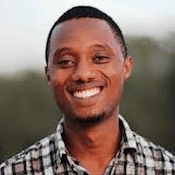 He then joined an entrepreneurship course in Kigali, which prepared him to use his passion for farming to make money. In 2012, he started the agribusiness company Paniel Meat Processing, which works to add value to local livestock, and sells all kinds of meat products. In 2016 he launched Livestock Bank, which helps provide farmers with livestock and other farming inputs, so that they can produce animals in quality and quantity. As an entrepreneur, he has attended different trainings and courses on agribusiness, to increase his knowledge and help his fellow farmers to innovate and become more successful in their work. Today, he trains young entrepreneurs and coaches rural farmers, with the aim of changing the way agribusiness is done, helping smallholder farmers to create more jobs in the poorest places of the world. Some predict that, by the end of the century, 13 African cities will surpass New York City in population. As African economies grow and their citizens become more urbanized, their standards of living and meat consumption are also likely to increase. This shift will reshape the continent's agriculture industry – and entrepreneurs like Herve Tuyishime are responding. Tuyishime explains how his two interrelated businesses are helping satisfy Africans' growing appetite for meat, and bringing Rwandan farmers into the supply chain.